This article is about skin changes that occur in hypothyroidism. The word myxedema was historically used to refer hypothyroidism in general. For the related medical emergency, see myxedema coma. The word myxedema originates from μύξα, taken from ancient Greek to convey 'mucus' or 'slimy substance', and ὁοίδημα for "swelling". It can also be thought as nonpitting edema, in contrast to pitting edema. Additional finding include swelling of the arms and legs and significant ascites. 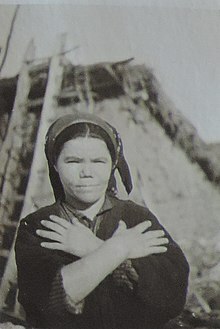 Woman with myxedema, Bulgaria, 1930s. Myxedema can occur in the lower leg (pretibial myxedema) and behind the eyes (exophthalmos). Severe cases, requiring hospitalization can exhibit signs of hypothermia, hypoglycemia, hypotension, respiratory depression, and coma. Myxedema is known to occur in various forms of hypothyroidism, and also in Graves' disease. One of the hallmarks of Grave's disease is pretibial myxedema, myxedema of the lower limb. Myxedema is more common in women than in men. Hyperthyroidism, associated with pretibial myxedema and exophthalmos. Pretibial myxedema can occur in 1–4% of patients with Graves' disease, a cause of hyperthyroidism. Myxedema describes a specific form of cutaneous and dermal edema secondary to increased deposition of connective tissue components. The connective fibres are separated by an increased amount of protein and mucopolysaccharides. These can include glycosaminoglycans, hyaluronic acid, chondroitin sulfate and other mucopolysaccharides. This protein-mucopolysaccharide complex binds water, producing non-pitting boggy edema, in particular around eyes, hands, feet and in the supraclavicular fossae. Myxoedema is responsible for the thickening of the tongue and the laryngeal and pharnygeal mucous membranes, which results in thick slurred speech and hoarseness, both of which are seen commonly in hypothyroidism. Fibroblast stimulation. It is thought that fibroblast stimulation by the thyroid stimulating hormone (TSH) receptor increases the deposition of glycosaminoglycan, which results in an osmotic edema and fluid retention. It is thought that many cells responsible for forming connective tissue react to increases in TSH levels. Lymphocyte stimulation. In Graves' thyroid disease, lymphocytes react against the TSH receptor by inappropriately producing thyroid-stimulating immunoglobulin (IgG; type II hypersensitivity). Lymphocytes react not only against thyroid receptors, but also any tissue with cells expressing the receptor. This can lead to tissue damage and scar tissue formation, explaining the deposition of glycosaminoglycans. 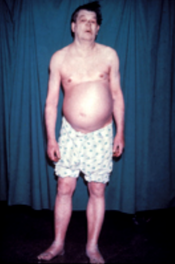 It is often possible to diagnose myxedema on clinical grounds alone. Characteristic symptoms are weakness, cold intolerance, mental and physical slowness, dry skin, typical facies, and hoarse voice. Results of the total serum thyroxine and free thyroxine index tests usually will confirm the diagnosis. Primary treatment is prompted by the administration of adequate doses of either the thyroid hormone l-thyroxine given intravenously or by giving L-triiodothyronine via a nasogastric tube. It is essential to identify and treat the condition precipitating the coma. Myxedema coma is rare but often fatal. It occurs most often in elderly women and may be mistaken for one of the chronic debilitating diseases common to this age group. Though the exact cause of myxedema is still unclear, a wealth of research has demonstrated the importance of iodine. In an important study the researchers showed that in the myxedematous type of cretinism treatment with iodine normalizes thyroid function provided that the treatment is begun early in the postnatal period. If not, the prognosis remains dismal. Myxedema was first treated successfully in 1891, when George Redmayne Murray diagnosed a 46-year-old woman with the disease. He prescribed an extract from sheep thyroid. The patient improved significantly within a few weeks and lived another 28 years while taking the sheep thyroid extract. ^ a b Berger, William D. James, Dirk M. Elston, Timothy G. (2011). Andrews' Diseases of the skin : clinical dermatology (11th ed.). [London]: Saunders/ Elsevier. ISBN 978-1-4377-0314-6. ^ Schneider, Arthur S.; Kim, Philip A. Szanto; with special contributions by Sandra I.; Swanson, Todd A. (2009). Pathology (4th ed.). Philadelphia: Wolters Kluwer Health/Lippincott Williams & Wilkins. p. 314. ISBN 978-1451109061. ^ "Pretibial Myxedema". Retrieved 2009-03-27. ^ a b c McConahey, W. M. (March 1978). "Diagnosing and treating myxedema and myxedema coma". Geriatrics. 33 (3): 61–66. ISSN 0016-867X. PMID 624451. ^ a b Lindholm, J.; Laurberg, P. (2011). "Hypothyroidism and Thyroid Substitution: Historical Aspects". Journal of Thyroid Research. 2011: 809341. doi:10.4061/2011/809341. PMC 3134382. PMID 21760981. ^ Vanderpas, Jean B.; Rivera-Vanderpas, Maria T.; Bourdoux, Pierre; Luvivila, Kapata; Lagasse, Raphael; Perlmutter-Cremer, Noémi; Delange, François; Lanoie, Leo; Ermans, André M. (1986-09-25). "Reversibility of Severe Hypothyroidism with Supplementary Iodine in Patients with Endemic Cretinism". New England Journal of Medicine. 315 (13): 791–795. doi:10.1056/NEJM198609253151302. ISSN 0028-4793. PMID 3018564. ^ "Eating Organs to Cure Disease". Tacomed.com. Retrieved 15 June 2017.